A course certificate values your participant’s effort and knowledge and gives proof of his newly learned skill. It serves as a token of appreciation, as well as a remembrance of the training. Therefore, a certificate should be attractive, recognizable and professional looking. 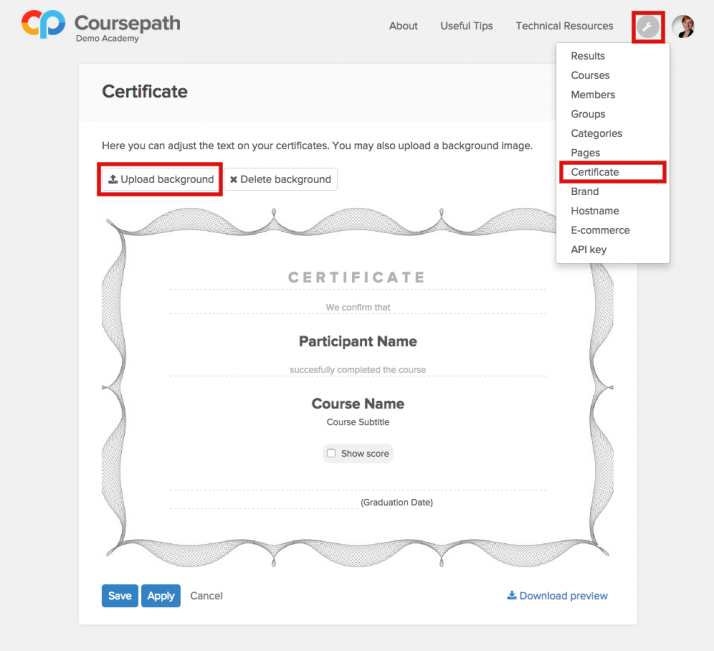 With Coursepath’s new certificate feature, you can now upload and modify your own company certificate. Personalize it by adding a custom background design, your corporate logo and a short course description. If needed, you can also show the test score of the individual on the certificate. Be proud of what you and your training participants have achieved together. Creating a nice and professional-looking course certificate emphasizes your participant’s learning achievements and encourages further training. Start by uploading a custom background design of the certificate that reflects your corporate identity. To do this is very easy. Just go to the “Setup” icon and choose the “Certificate” option. You can then upload your own background design. You may also want to opt for the “download preview” to make sure that it is exactly the certificate that you want your participants to receive when they have finished the course. The Certificate option allows uploading of individual certificate background layout and downloading a preview of the certificate. This preview displays the participant’s certificate received after course completion. Test scores serve as an important and motivating learning method in tracking a participant’s progress. They can also be used as a proof or criteria in qualifying for a special program, study or further training. To display the participant’s level of achievement, simply click the “Show score” box in the Certificate editor. In the certificate editor you can adjust the background text. Ticking the box “Show score” allows showing of the participant’s test score on the certificate. 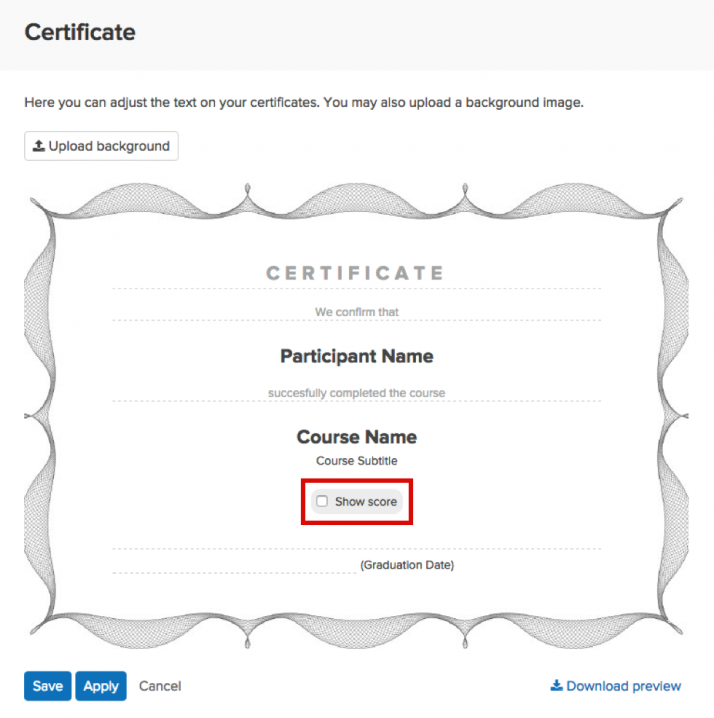 Convenient for trainers: Participants receive certificates automatically after course completion. To make sure that the participant has had a successful training, you can set passing rates in the course. Only participants who have passed the course are able to receive the certificate. 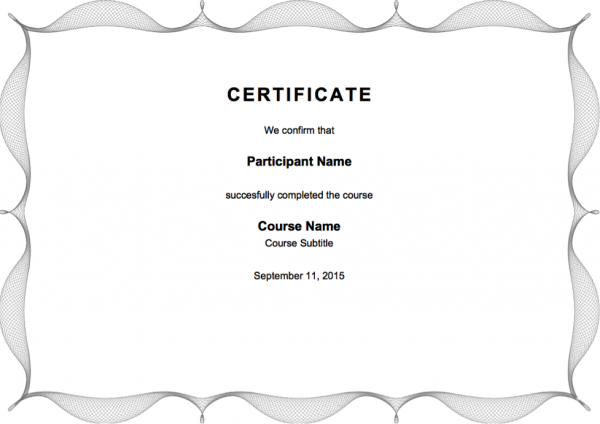 The participants’ name and the course title are automatically added into the certificate. If you wish to edit the predefined background text, you simply type a new text in the certificate editor.